Prost! 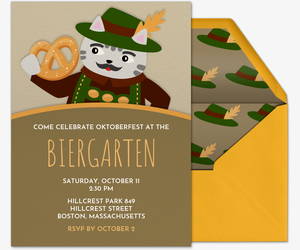 Gather the gang this September and October for Oktoberfest by sending a free or Premium digital invitation from Evite. 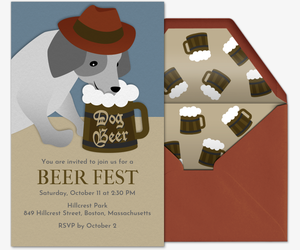 Set the tone with our folk festival designs, featuring beer boots, pretzels, lederhosen, dirndls and even pets (dachshunds celebrate, too!). 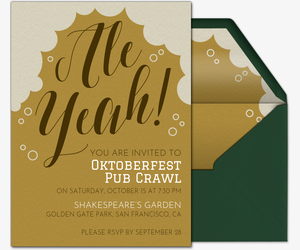 Meet at a bar, organize a pub crawl, plan a Munich-themed backyard party, go to a festival, or hit the local biergarten -- do it all with our specially-made Oktoberfest invitations. Make it easy on yourself with our online invitations. 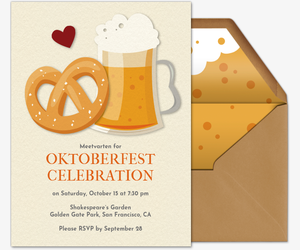 Provide all the main details on your invitation, then keep the conversation going on your event page. Going paperless means you can track RSVPs and manage your guest list all in one place. Meanwhile, encourage guests to post comments and share photos before, during, or after the event. 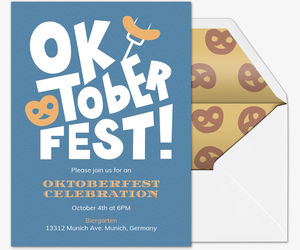 Then, spread word about the festivities by posting your shareable invitation link on social media or sending via text. 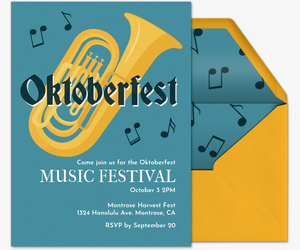 Oktoberfest only comes along once a year, so make it a party with our Premium invitations. Our Premium invitations are ad-free and take after traditional printed invitations by including a matching envelope, digital stamps, and optional extra photo or text cards. Pricing depends on the size of your guest list. Keeping it casual by just grabbing drinks? 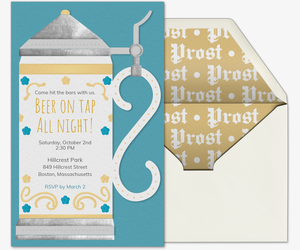 Browse our happy hour or cocktail party invitation collections for more designs. Taking a big trip to Germany to celebrate with the locals? Browse our Trips and Getaways invitation collection. 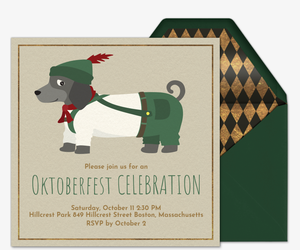 Or, if you’re celebrating in another way, check out our dinner party invitations, theme party invitations, hostess party invitations, and outdoor fun invitations. Then celebrate all the fall festivities with birthday invitations, holiday party invitations, wedding invitations, baby shower invitations, and more.